I was contacted by a lady called Bethan Mair. 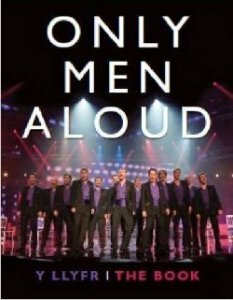 She wanted to use my translation of Ar Lan Y Mor in her book Only Men Aloud – Y Llyfr / The Book. The book arrived this morning, and there’s the original Welsh and on the facing page my translation, complete with footnotes and my website address, not to mention some rather nice images. I feel very satisfied. It’s a nicely laid out book as well. Oddly enough, we’d just been watching a programme on S4C about Only Men Aloud on Ynys Enlli. I must have a chat with my musically talented neighbour, and see if he can arrange it for my wife’s choir. I’ve just been rereading EE Smith’s Skylark series. Genuine 1930’s hokum, with my all-time favourite dreadful line “Ammoniacal Copper Sulphate, hot dog, let’s go”. [Their religion] is a very peculiar mixture, partly theology, partly Darwinian evolution and partly pure pragmatism. They believe in a First Cause. They recognise the existence of an immortal soul. They believe that the First Cause has laid down the survival of the fittest as the fundamental law, which accounts for their perfect physiques. They have attained this state by centuries of weeding out the unfit. They have no hospitals for the feeble-minded or the feeble bodied; all such are executed. The same reason accounts for their cleanliness, physical and moral – vice is practically unknown since they correct wrong living by terrible punishments. They believe that the higher the type, the faster the evolution and the sooner will mankind reach the Ultimate Goal and know all things. Believing that the fittest must survive, and of course thinking themselves to be the superior type, it is ordained that [their enemies] must be destroyed utterly. I used to live in Germany, and I’ve visited Dachau and Auschwitz. Believe me, that quote could come straight from Hr Hitler himself. OK, later books introduce more civilised types who abhore violence, but it still came as a bit of a shock. Even more worrying, if that the society’s views change over time, and something acceptable then is now so appalling, does it not make us wonder what a future society will make of our standards. They thought they were enlightened and superior to those who had gone before. Are we in any way more superior to them?